Library Square at Central Branch of the Vancouver Public Library. Photo by VPSN. 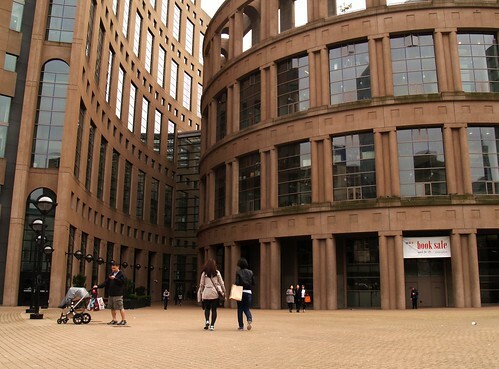 The BC Library Association has kindly invited the Vancouver Public Space Network to speak about our public space advocacy and engagement work at their annual conference happening in Vancouver from Monday, March 31st to Wednesday, April 2. The BCLA conference, organized around the theme “Hello World!” (a shoutout to computer programmers), promises to be an exciting interdisciplinary event — with session streams on Access, Evidence, Community, Place (that’s us), and Work. They have secured thoughtful keynote speakers known for their cutting-edge work in storytelling, design and activism, as well as sessions with speakers from other local organizations like Bing Thom Architects, the BC Civil Liberties Association, and Mozilla Labs. Check out the BCLA Connect 2014 Conference website for more information about the event – early bird registration closes February 25. You can also follow along with the event’s updates through its Twitter account at @BCLibraryconf.